THIS TRUCK IS SOLD, BUT WE CAN BUILD THEM THE WAY YOU WANT !! NEW WATER TANK, APP.6000 GALLONS --- 4 VALVE SPRAY SYSTEM: Four [ajustable] independently air operated UTEAV9030 valves. Two valves mounted to each side front of truck and two valves mounted to each side rear of tank. Valves are independently air operated from cab control console. All plumbing in schedule 40 steel pipe with groove sytle flexible fittings. BERKLEY WATER PUMP: B3ZRMS 4X3 centrifugal cast iron pump 750GPM @ 60PSI, with ceramic mechanical seal. Rear mount ladder, 1" sight gauge on rear. LIGHTS: Standard DOT markers, stop and clearance. BAFFLES: 18"crawl hole, 6"flow hole. OPTIONS: Side spray valve available, 2" fitting with quick connection for filling pools, [1"to 1 1/2"] hose reels [50-100 ft.] available, manual or electric. 2008 International 4400 --- Tandem Axle, DT466 International 300 HP, Eaton-Fuller Manual 10 Speed, 12,350 Front Axle, 40,000 Rear Axle, 190" Wheelbase, 18' Bridge, Air Ride, Air Brake, Full Locking Rears, Steel Wheels, Aluminum Fuel Tanks, Heated Mirrors, AM/FM Cassette, Power Windows, P/L, AC. 2007 International 7400 --- Tandem Axle, DT466 International 300 HP, Eaton-Fuller Manual 10 Speed, 14,000 Front Axle, 40,000 Rear Axle, 202" Wheelbase, 19' 1" Bridge, Hendrickson Walking Beam, Air Brake, Differential Lock, Steel Wheels, Single Stack, Air Ride Cab, Dual High Back Seats, High Level Interior, Heated Mirrors, Cruise Control, AM/FM Cassette, P/S, AC. 2007 International 7400 --- Tandem Axle, DT466 International 300 HP, Eaton-Fuller Manual 8LL, 18,000 Front Axle, 40,000 Rear Axle, 210" Wheelbase, 20' Bridge, Hendrickson HAUL MAX, Double Frame, Air Brake, Full Locking Rears, Steel Wheels, Engine Heater Plug, Single Stack, Aluminum Fuel Tank, Air Ride Seats, High Level Interior, Cruise Control, Tilt Steering Wheel, AM/FM, P/S, AC. New Arrival 2006 International 9400i --- Tandem Axle, C15 Caterpillar 475 HP, Eaton-Fuller Manual 18 Speed, 4.11 Ratio, 12,000 Front Axle, 40,000 Rear Axle, 192" Wheelbase, 18' Bridge, Air Ride, 3 Stage Engine Brake, Air Brake, Differential Lock, Aluminum Front Wheels, Aluminum Rear Wheels, Aluminum Fuel Tanks, Dual High Back Seats, Wood Grain Dash, Heated Mirrors, Cruise Control, Tilt & Telescopic Steering Wheel, AM/FM Cassette, Power Windows, P/L, P/S, AC. New Arrival 2005 INTERNATIONAL 9200I --- Tandem Axle, C13 Caterpillar, Eaton-Fuller Manual 13 Speed, 12,000 Front Axle, 40,000 Rear Axle, 190" Wheelbase, 18' Bridge, Air Ride, Air Brake, Differential Lock, Ledwell Body, Aluminum Fuel Tanks, Wood Grain Dash, Heated Mirrors, Cruise Control, Tilt & Telescopic Steering Wheel, AM/FM, Passenger Power Window, P/S, AC. 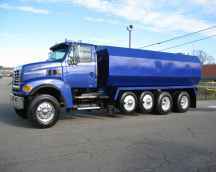 New Arrival 2005 Kenworth T300 --- Single Axle, C7 Caterpillar 250 HP, Eaton-Fuller Manual 10 Speed, 4.11 Ratio, 12,000 Front Axle, 21,000 Rear Axle, 153" Wheelbase, 12' 9" Bridge, Spring, Steel Wheels, Aluminum Fuel Tank, Daylite Doors, Peep Window, Dual High Back Seats, High Level Interior, Cruise Control, AM/FM, P/S, AC. 2005 Ford F750 --- Single Axle, C7 Caterpillar 210 HP, Allison Automatic, 12,000 Front Axle, 21,000 Rear Axle, 195" Wheelbase, Spring, Air Brake, 16' Steel Body, Steel Wheels, Cruise Control, Tilt Steering Wheel, AM/FM, P/S, AC. New Arrival 2005 International 9200I --- Tandem Axle, C13 Caterpillar, Eaton-Fuller Manual 13 Speed, 12,000 Front Axle, 40,000 Rear Axle, 187" Wheelbase, 17' 8" Bridge, Air Ride, 3 Stage Engine Brake, Differential Lock, Steel Ledwell Body, Aluminum Front Wheels, Aluminum Rear Wheels, Aluminum Fuel Tanks, Daylite Doors, Dual High Back Seats, High Level Interior, Wood Grain Dash, Chrome Gauge Package, Heated Mirrors, Cruise Control, AM/FM Cassette, P/S, AC.